Best Western Plus Lex Cebu launches a limited-time discount promo for travelers who want to relish a comfortable stay in the vibrant city of Cebu. The web-exclusive deal is offered at http://www.bestwesternlex.com. Online visitors need only to click the "Check availability and prices" button to start the reservation process. A virtual calendar will appear on the page where guests can indicate their arrival and departure dates. A list of rooms available on their chosen stay schedule will then be displayed from which guests may select the type and number of rooms they wish to secure. Also shown on this page is information regarding the special deals and inclusions offered by this hotel in Cebu City. *Children aged 5 and below get free meal (maximum of 2 kids only), while children aged 6 to 12 will be charged PHP 200 for breakfast. Promo details may change without prior notice. To complete the reservation under this promo, guests just need to fill out a short form. No prepayment required. The system will then instantly send a confirmation email containing the reservation details and record of payment. This efficient and secure online system is powered by DirectWithHotels. All transactions made via this booking engine are protected by Trustwave and DigiCert. All rooms in this Cebu City accommodation has memory beds and goose feather pillows, an individually controlled air-conditioning, 32" LED satellite TV, mini-bar, radio, alarm clock, iPOD dock, safety deposit box, hair dryer, working desk with lamp, and bath amenities. Available facilities and services include a restaurant, gym, an infinity pool, meeting rooms and business center, laundry and dry cleaning, foreign currency exchange, shuttle service, car rental, and massage services. 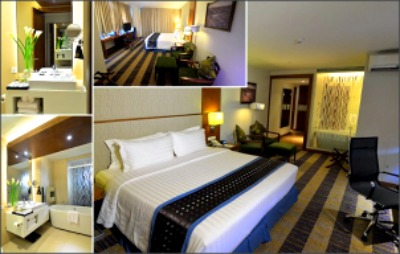 To know more about this hotel in Cebu City, log on http://www.bestwesternlex.com/. Escario St. corner Juana Osmena Ext.